Dennis Carey, 51, was a terrific chef. Both his firefighter brothers and family benefited from his culinary skills. He was always trying new recipes and had every issue of “Bon Appetit” from the past 15 years. Thanksgiving was his day. He handled the turkey, the stuffing, the apple pies and maybe even an Italian specialty or two to please his wife’s family. There were four members of Haz-Mat Co. 1 who were scheduled to have their FDNY physicals that morning at HQ in Brooklyn. Carey was one of these who drove to the site in a Chief’s car, gathering equipment on the way. This 20-year veteran had been planning to retire in January. He and his wife had begun dreaming of travel: 3 months in Aruba, another month in Europe. Their two children were grown and living on their own. His body was found in a stairwell in the North Tower along with 15 colleagues on October 2nd. This entry was posted in Better Angels Stories and tagged 343, 9/11, better angels, Dawn Siebel, Dennis Carey, FDNY, firefighter, firefighters, firefighters of 9/11, Haz-Mat 1, LODD, Manhattan, memorial, NFFF, paintings, portraits, World Trade Center, WTC. Bookmark the permalink. 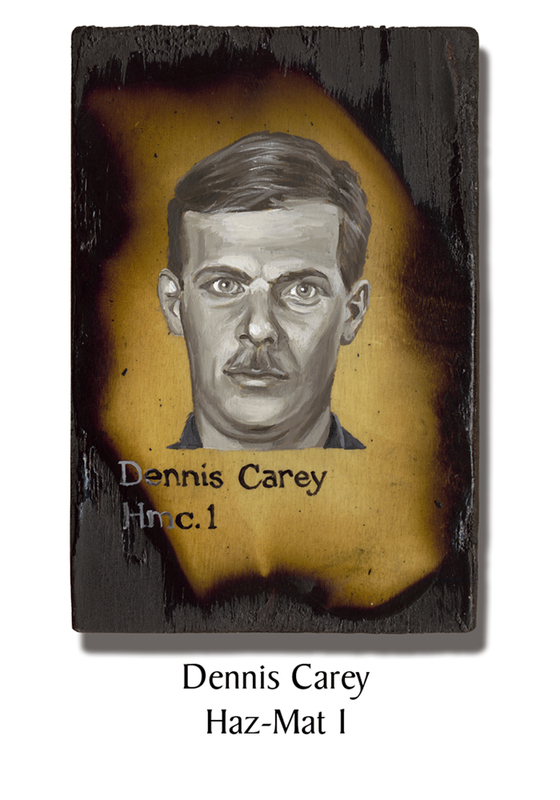 I met Dennis at the National Fire Academy in Emitsburg Maryland many years ago. He was one of the nicest men I have ever met and very generous and you could tell immediately his family was very important in his life. Since I was from a small city in Louisiana (Bossier City) He offered to bring me home between class break on the weekend to show me around New York. I had another obligation and couldn’t go. He tore off the back of a New York newspaper add that had the Manhattan skyline and wrote on it “Ian this is New York, Come see me” and signed it Dennis. I regret not being able to go with him to this day! God never ceases to amazes me of the blessings of whos paths he allows us to cross in this very large world. Still Praying for his family Jeanne, Nichole and Dennis Jr.
Just saw an episode of The Little Couple where Jennifer Klein has Squad 288 teeshirts for her son William she said in memory of Uncle Dennis given by Aunt Jeanne.Are they related? RIP and God Bless.